“Our Lady said, ‘Do whatever he tells you.’ So in our life we must always try to live according to the teachings of Christ. 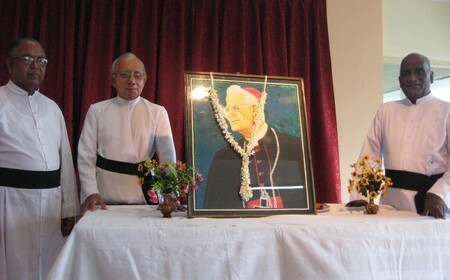 Only in this way will we improve our mission as Christian workers in this society”, said Fr Sixtus Kurukulasuriya marking the 129th anniversary of the birth of Cardinal Joseph Cardijn. Also present at the function were Fr Ernest Porutota whom together with Fr. Kurukulasuriya have contributed to the growth of the YWC, and Fr Reid Shelton Fernando, YCW chaplain for the diocese of Colombo. The YCW was founded in Sri Lanka in the late 1940s. The young members of this movement then created its “adult” counterpart, the Christian Workers Movement (CWM) in 1953. In the late ’60s, the Cwm has grown at an international level. The Bishops’ Conference of Sri Lanka considers the inter-group and not national. Currently it has between 300 and 400 members in four dioceses. Nationally, there are about 50 groups, 23 in the Archdiocese of Colombo.